Established in 1901 in a single building, today Iowa Methodist has become an important regional medical center and teaching hospital, and a regional campus for the University of Iowa. Located in downtown Des Moines on a 42-acre campus, Iowa Methodist employs nearly 4,000 people and has 370 staffed beds. Iowa Methodist Medical Center provides care to tens of thousands of patients each year, providing a broad spectrum of hospital-based services including, cancer treatment, cardiac care, maternity and women's services, emergency and trauma treatment, physical rehabilitation, wellness programs, surgery, orthopaedics and critical care. Iowa Methodist is the designated Level I trauma center for the Central Iowa region. Iowa Methodist Medical Center is part of UnityPoint Health - Des Moines, which includes Iowa Lutheran Hospital, Methodist West Hospital, Blank Children's Hospital, John Stoddard Cancer Center and Iowa Health Physicians and Clinics. 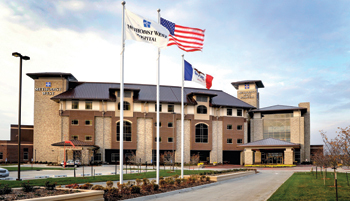 Learn more about Iowa Methodist Medical Center. Methodist West Hospital opened in October 2009 to serve the rapidly growing western communities. The 95-bed, state-of-the-art Methodist West Hospital offers a variety of services including: orthopaedic services, cardiovascular and pulmonary services, emergency department, maternity services and surgery. Methodist West was designed specifically to care for orthopaedic needs. The Orthopaedic Center of Excellence has 34 beds featuring private adaptable rooms with the ability to be flexible as healthcare delivery and patient needs change. The emergency department at Methodist West Hospital serves patients of all ages for trauma, medical, surgical and psychiatric evaluations. The Emergency Department has two trauma rooms, two triage rooms, 13 treatment/exam rooms and ambulance service in collaboration with City of West Des Moines. Methodist West Hospital offers experienced staff and 24/7 on-staff neonatal support in partnership with Blank Children's Hospital. The 12-bed maternity center includes private labor, delivery, recovery and postpartum rooms. The surgery department contains 14 private pre-operative rooms, six leading edge operating rooms, a cardiovascular catheterization lab and an endoscopy suite. Learn more about Methodist West Hospital. 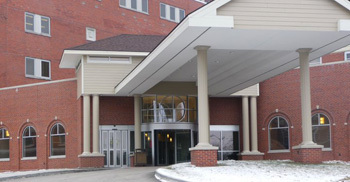 The VA Medical Center in Des Moines, Iowa, is a 100 bed acute care hospital providing acute and specialized medical and surgical services, residential outpatient treatment programs in substance abuse and post-traumatic stress and a full range of mental health and long-term care services, as well as sub-acute and restorative rehabilitation services and a domiciliary. Located on 47 acres, the VA is available to the approximately 120,000 veterans who live in central Iowa. VA ambulatory care clinics log more than 200,000 visits annually. The VA Central Iowa Health Care System (VACIHCS) provides community Based Outpatient Clinics (CBOCs) in Mason City, Fort Dodge, Knoxville, Marshalltown and Carroll. The medical center has an active graduate medical education program. Learn more about the VA Central Iowa Health Care System. This county hospital was originally created over 70 years ago to ensure that area residents could receive needed medical care regardless of their financial resources. Additional construction in the 1990's and extensive remodeling in the past two years expanded and improved the medical-surgical care areas where residents train. Broadlawns Medical Center is the largest publicly funded hospital in Iowa and provides a unique and rewarding environment for learning. Residents experience a variety of illnesses and health care issues that are not common to most programs. The teaching faculty are firmly committed to the mission of teaching and "caring for our community." Learn more about Broadlawns Medical Center.